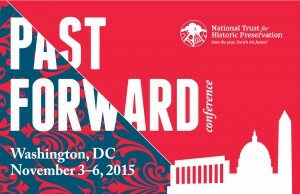 PastForward is the premier educational and networking event for those in the business of saving places. This year, at PastForward 2015, we’ll begin a year-long celebration of the National Historic Preservation Act’s 50th anniversary with programming that celebrates and honors the past while looking decisively forward toward our next 50 years. In the nation’s capital we will convene the full, diverse and expansive constituency of preservation players from individuals to elected officials, federal agencies to architects, scholars to activists.